The LM006 is a WLAN 11n mini dongle, which fully supports the features and functional compliance of IEEE 802.11n,e and i standards. It supports up to 150Mbps high -speed wireless network connections. It is designed to provide excellent performance with minimum power consumption and enhance the advantages of robust system and cost-effective. It is targeted at competitive superior performance, better power management applications. 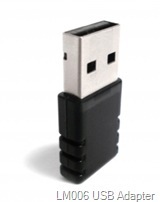 LM006 Driver (Support Win2000, XP, Vista 32/64bit, Win7 32/64bit, Linux, Mac OS), 22.3MB.